I would like to apologize (1) for the extremely late nature of this recap, and (2) for the lie I told in the last one. I was under the impression that three episodes of Constantine were going to be released from the time between my last recap and January 1st. As it turns out, I was wrong. A single episode, “The Saint of Last Resorts – Part 1” was released and there will not be another until January 16th, 2015. Things have been crazy for me the last few weeks and I have not been able to take a deep breath since about a few days ago. I doubt anyone lost too much sleep over this recap (however, if you did, The Young Folks community and I are grateful). In case you did, here it is. In “The Saint of Last Resorts – Part 1,” a demon kills a woman and steals her newborn baby, post-birth in a Mexican convent. Anne Marie (Claire van der Boom), a former member of Constantine’s “merry” gang, who became a nun at this very convent after the Newcastle incident, calls upon Constantine for help. When Constantine arrives, more strange disappearances begin to occur and the hunt is on for who or what is doing it. Meanwhile, Zed’s past catches up with her even more, this time in a deadlier fashion. The problem with these “mystery of the week” type episodes is that each episode is so obviously going to be solved, that there is hardly any reason to care. While episodes like “Blessed are the Damned” serve as exceptions, this episode is hardly comparable. I found no reason to get connected with anything in this episode . . . until the tail end of it. After the usual stupid reveal and dumb reference to the “dark uprising,” something truly interesting happens: Constantine is shot quite out of nowhere and appears to be dying as the screen cuts to black. Seeing as the show is called freaking Constantine, I was shocked for only a second and a half at this reveal, but the style choice was a respectable one and this “twist” opens a world of possibilities for Part 2 of the episode. 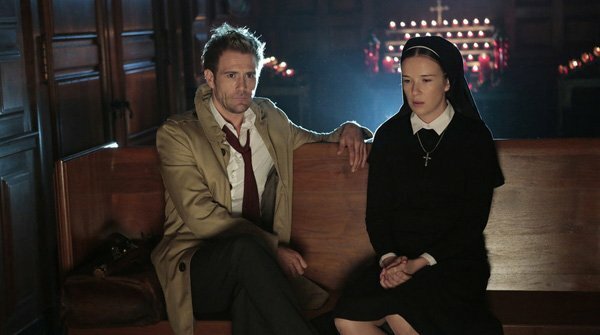 A hell-bound episode where Constantine escapes Satan himself? Could be. The episode would have been much stronger if Zed’s subplot had been the central plot. While not exactly pulse-pounding, Zed’s story provided a bit of surprise and action and was altogether more entertaining than Constantine’s own story. Prior to this episode, my speculation was that Zed was simply the runaway daughter of an oppressive minister, but no. There is much more too it and the show treats us to her past coming to meet her, quite literally. I really like where Zed’s story is going and the way the episode handled it; it is not just a reference, but a full-on plot advancement. Now that is what I like to see!!! For the most part, “The Saint of Last Resorts – Part 1” acts as a boring, dull, and a smidge unintentionally silly filler episode. Regardless of these less than stellar qualities, the episode is by no means awful. The acting, Zed’s storyline, the buildup for a hopefully more relevant Part 2 episode along with a decent script elevate what could have been a bad episode to one that is simply alright. P.S. I know this is a huge nitpick, but this episode made me wonder why so many people in the show’s universe so easily believe in the existence of the supernatural and why nobody from any past episode has spread ANY word yet. I know it is just a show, but . . . come on! This is not Men in Black, where people’s memories are erased. I guess these people are just really polite to occultists. Or they’re just stupid. Who knows?